Students who find it necessary to withdraw from all of their classes for the current semester or for a subsequent semester for which they have already registered must complete a Total Withdrawal Request Form. This form must be submitted by the end of the 12th week of classes for the semester in which they wish to withdraw. The withdrawal form and instructions are available from the dean or advisory center of each school or college. Students who are physically unable to complete the withdrawal in person, students who are administratively withdrawn, and students who have special needs due to extenuating circumstances should contact their dean’ s office or advisory center for assistance. 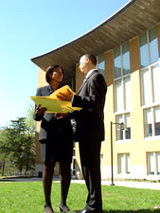 Students who complete a total withdrawal from the University must apply for or request readmission to the University by published deadlines. The procedure for readmission depends on the length of the student’s absence from the University. All students must report to the Office of Student Financial Services. Rm. 218, Administration Building to discuss the status of and adjustments to their account. All students must report to EM/Records, Rm. 104 Administration Building to submit the completed Total Withdrawal Request form and surrender their CapstoneCard.